I received product for review from SentrySafe. The opinions within this post are of my own and I was not influenced in any way. Please do your own research before purchasing products or using services. Your opinions and results may differ. 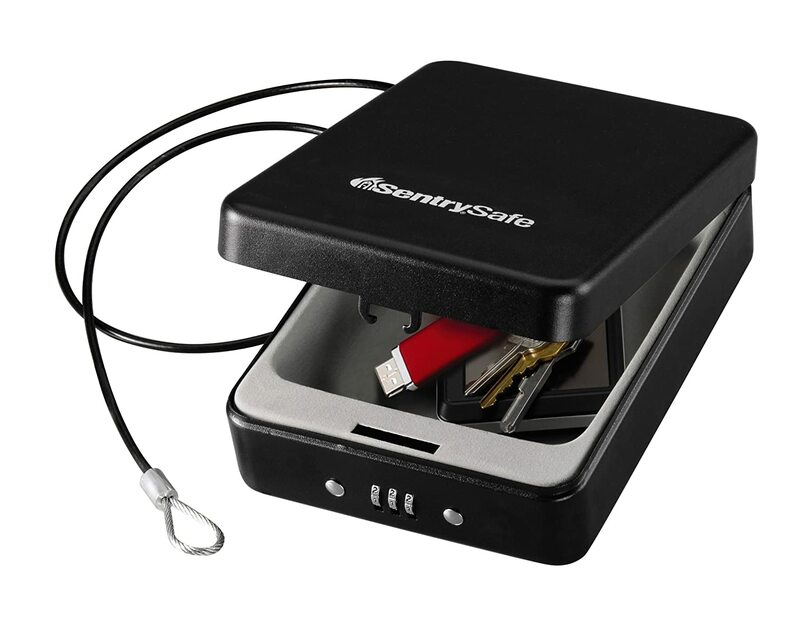 The Sentry Safe Small Portable Combination safe is lightweight and ideal for MP3 players, cell phones, cameras, gaming devices, jewelry, and other small valuables. Granted, it doesn't hold large objects, but it does keep small assets protected. Instructions are included, and they are easy to understand. By following the instructions, you can set the combination to the three numbers you want for access. It is important to note that there is no override code for the safe, so it's crucial to always know the combination to avoid being locked out. A tethering cable is included with the safe and can be attached to affix the portable safe to a fixed object if desired. The cable also doubles as a carrying handle. The safe is made with steel construction for durable and reliable protection. The interior is carpeted so that objects inside stay safe and scratchproof. I've started taking this portable personal safe with me when I go on day trips or to events. It usually holds my cash, cell phone, and car keys. When I don't have the safe on me, my teenage son uses it to store his extra money. Although there's no guarantees in life about safety and security, this safe helps give me a peace of mind that my valuables are protected. 1. Pack Smart and Secure – Avoid over-packing by checking the weather forecast for your destination in advance and packing accordingly. Also, keep your luggage protected with on-the-go security products such as TSA-accepted luggage locks like the Master Lock 4688D or the 4680DBLK. These affordable and reliable solutions keep your valuables protected whether you’re checking bags at the airport while en route to your destination, or upon arrival and storing valuables in your luggage in your hotel room. 2. Prepare for the Unexpected – If you are traveling by car, have your vehicle examined beforehand and stock up on emergency supplies such as blankets, bottled water, snacks, flashlights and jumper cables. Ensure your tires have good tread, are properly inflated and make sure you can locate your spare. Be aware of road conditions before leaving the house and plan accordingly. 3. Tap into Technology – With new apps geared toward travelers, getting to your destination and enjoying your surroundings upon arrival is easier than ever. There are apps that offer real-time travel advice personalized to your exact location, weather conditions and interests along with direction-related apps that offer tips on traffic, road conditions and construction. You can also securely store copies of travel documents, health records and passports through the Master Lock Vault app for convenient 24/7 access. 4. Enjoy the Elements Worry-Free – For less than $30, portable safes like the SentrySafe Small Portable Combination Safe or Master Lock SafeSpace Portable Personal Safe offer peace of mind and keep your cell phone, money, keys, jewelry, credit cards and other small valuables locked and secure while you take a walk on the beach, dip into the pool or enjoy an adventure of any kind. The compact and versatile safes feature a durable cable, which can be wrapped securely around a fixed object or serve as a carrying handle. 5. Limit Social Media – While it’s appealing to share details of your vacation via social networks, this could make you a target for cyber-savvy burglars. Publically posting the dates of your trip or sharing check-ins and photos tagging your location creates a security risk to your home. Instead of posting in real-time, capture moments and photos and share via one photo album or video once you return from your trip. One person will win a SentrySafe Small Portable Combination Safe. I would keep my "mad money" in there. I might store some jewelry that I want to keep safe. I might store money and jewelry. I would put extra cash we keep in the house in it, as well as any heirloom jewelry or other small valuable things. When traveling I would keep important documents, money, jewelry in there. I love this little safe, it looks very convenient. I am planning a trip to Minnesota in a few months, and will be staying in a hotel. I would carry my cash, credit cards, and good jewelry I'd take, and my room key in this. Fabulous little safe, just perfect for travel! I'd keep important documents and some very special jewelry inside. I would keep my passport in there, just to name one thing. I would definitely hide my "mommy money." No matter where I hide it, my hubby always finds it. I would keep documents, coins, and antique jewelry in the Sentry safe if I won! I dont know what I might would store in the portable safe. Perhaps my important papers. I could keep it in my house and could grab it quickly if the need were to arise. I would get this for my husband. He has a company truck, but he has had so many random things turn up missing. He could keep spare keys in there or probably his phone, anything he can stuff in there! What a great way to keep your valuables safe while travelling! I'd keep my passport and credit cards in it! I would keep jewelry in it. We would keep our passports and important papers in this safe. My passport, keys, money, and jewerly would be kept in this safe. I would keep my passport and jewelry in it. I think I would store passports in it. I would keep my chocolate in it. I would store some of my jewelry! I would store my extra car and house keys along with my passport. I would keep passports and money. That's perfect for jewelry when you're out of town. I don't have any valuables at the moment. But maybe if I win this I would get a few of them. Maybe some real Gold Jewelry would be nice. I would store my passport. I would keep some documents and emergency cash in it. I think this would be greart for jewelry or other small valuables. Cash and some other stuff. Just whatever I find to be personally valuable. I would store the WWII medals my uncle left me when he passed away. I would keep any of my more exspensive jewelry in this safe when traveling on the road. I would store a bond in the safe. Thanks for the chance to win! I would keep my jewelry and husbands watch in it. I'd keep passports, birth certificates and important documents in this! I would store my most important papers in the safe. This is a truly great way to do so. I would keep my portable hard drive in it. I would put our social security cards in it and my jewelry. I would put my keys and wallet in it when I'm in my car. I would put out birth certificates, and other original documents in it as well as insurance papers. I would use this for travel documents when traveling. I would store marriage license, birth certificates & passports in it. I would probably keep nice jewelry and other valuables in it. I would store my jewelry. If this was mine, I'd store jewelry in it! Cash, my passport, drivers license and jewelry when I travel would be something I'd store in it. I would actually give it to my in-laws as a gift. They just bought an RV and this would be the perfect size safe to store their valuables when they're on the road. I would store my birth certificate and ss cards in there. I would store important things like passports and birth certificates. I would keep our passports in this. I've been meaning to get one of these! I would use it for extra cash, a couple of backup flash drives, a few small hand-me-down pieces of jewelry from my grandmother, and hopefully still have space for a few very old family photos... they're very small and would fit perfectly. I would probably store my keys in it when I am traveling. All of my important documents! Great way to be prepared with important documents. I would keep my jewelry and money in the safe. 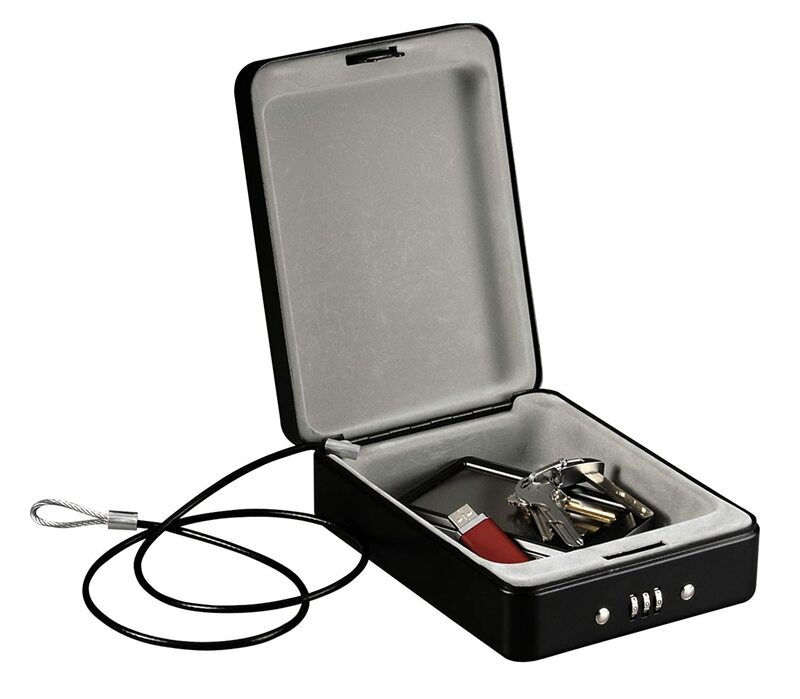 Would love to have the Sentry Safe Small Portable Combination Safe along on vacation / business trips to protect my phone, sunglasses, keys, passport, etc. I would keep my jewelry and identification inside! This safe would suit me so well for it would provide a place for my medical documents / records because I can NOT afford a laptop to help spread the word to doctors, nurses, paramedics and others when I have a episode. It's just the answer to a sought after senario which I've had since being injured in an accident! I would store my diamond ring and cash (save up for a rainy day) in it. I would store my passport when I travel. I would put all of our important documents in there! I would use this for money and credit cards! This is so cool! I might store my insurance paperwork in the new safe. I would put my knife in there. I'd put cash in it. Car keys when the kiddos are home and we're not....they much prefer our nice vehicles to their semi-junkers. I would keep important papers and keys in this safe, thanks! Passports, travelers checks, credit cards, IDs... Every single thing I don't want anyone else to see. I would use it to store my jewelry. I like how compact it is. I would use it at work...unfortunately we have people stealing at work all the time! I will put my important papers and documents inside. I might store documents in this safe.